In a small saucepan, bring the tomato sauce, wine, and garlic to a boil, stirring, over high. Reduce the heat to a simmer and reduce the mixture by half without stirring. Set aside to cool. In the bowl of a food processor, combine the cooled reduction, mayonnaise, green onions, and gherkins. Process until smooth or desired consistency. Transfer the mixture to a bowl and stir in the parsley, hot sauce, and salt. Season to taste. Cover and refrigerate for at least an hour. Sauce can be made a day in advance. In a large resealable plastic bag, combine the wine, mustards, horseradish, salt, and pepper. Add the fish strips, close the bag, and toss to coat. Refrigerate for an hour. In a large heavy bottom pan, heat the oil to 350° F. In a shallow bowl, whisk together the cornmeal, flour, cornstarch, and seasonings. Dredge the fish strips into the mixture, shaking off any excess. Fry a few strips at a time until golden, about 4 minutes. Drain on paper towels and repeat with remaining fish, maintaining oil temperature. 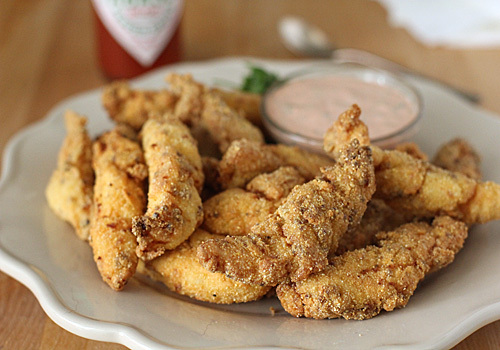 Serve with Tomato Tartar Sauce. Enjoy!